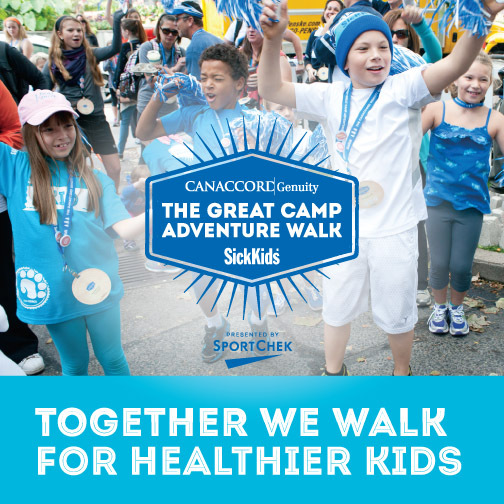 Toronto ON - September 15, 2014 – Join hundreds of families walking for The Hospital for Sick Children(SickKids) on September 27 by participating in the second annual Canaccord Genuity Great Camp Adventure Walk. Participants will go on a great outdoor walking adventure, through the streets of downtown Toronto, starting and ending at Fort York. Participants can choose whether they would like to walk 5, 10, 15 or 20 kilometres and stop at activity-filled campsites along the route. "We were inspired by the level of enthusiasm and generosity from the community and our partners during the inaugural event in2013, which saw 1,300 participants and raised more than $1.3 million for SickKids,"said Ted Garrard, President and CEO, SickKids Foundation. "We are thrilled to have Canaccord Genuity on board again as our title sponsor and excited to announce Sport Chek as our new presenting sponsor. We are looking forward to another fun-filled day with even more participants united in a common goal of helping to improve children's health." The event experience is designed with the whole family in mind and has activities for the young and the young-at-heart. The morning will kick-off with a flag raising ceremony at Fort York and everyone will depart on the Walk together. As title sponsor, Canaccord Genuity will play host to the Canaccord Genuity Fun Zone at Fort York, for participants to interact with exotic animals and enjoy face painting and other activities. "Our employees take a great deal of pride in our association with the world-class organization that is SickKids and the sense of community fostered through this event," said Paul Reynolds, President and CEO of Canaccord Genuity Group Inc."SickKids' commitment to providing excellent care and support for patients and their families requires ongoing investment, and happy, healthy kids are the best return we could hope for." 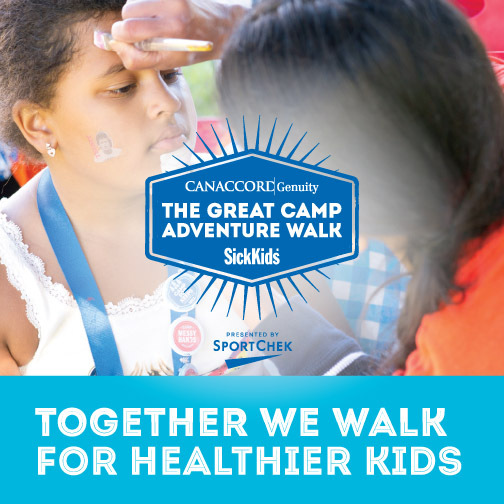 Along the route, there are several stops (campsites) including Sport Chek's 'Camp Spirit of Sport,' featuring meet-and-greet stations with Canadian Olympians and sport-themed activities. It will be located on Elm Street adjacent to SickKids. "The work Ted Garrard and SickKids Foundation are doing to raise awareness for The Hospital for Sick Children is outstanding,"said Michael Medline, President, Canadian Tire Corporation. "Sport Chek is honoured to participate in this event and we're bringing our passion for sport to life during the Adventure Walk by welcoming a number of Canadian Olympic heroes who will help inspire participants and add to the excitement of the day." Walkers can look forward to several additional campsites with other activities including a scavenger hunt, water play, arts and crafts, a talent show, sing-a-longs, s'mores and much more. Participants are able to walk as much or as little as they can with buses at each stop to shuttle them back to Fort York when they tire for a closing campfire. SickKids Foundation is also thrilled to announce that the following corporate sponsors have additionally signed on to support thisyear's event: PetSmart, Muskoka BearWear, Allen's, Bass Pro Shops, Clek,Continental Gold, Mandell Entertainment Group, and Reprodux. Several other organizations and individuals have also provided support to help bring this event to life. The tremendous support of the community is essential to helping fund world-class research, learning and care at SickKids. 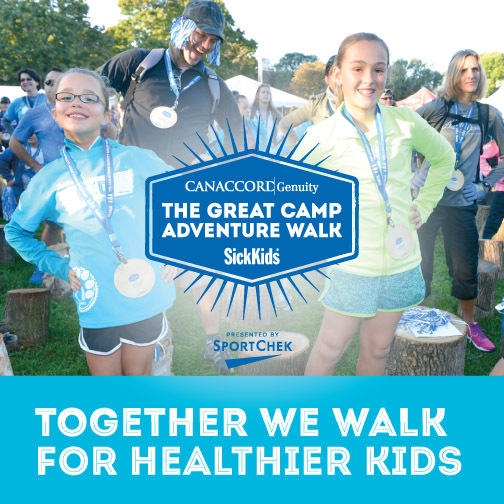 The Canaccord Genuity Great Camp Adventure Walk provides a fun opportunity to continue raising critical funds,which will support the Possibilities Fund at SickKids, dedicated to improving the health of children. The SickKids mission is to provide the best in family-centred, compassionate care, to lead in scientific and clinical advancement,and to prepare the next generation of leaders in child health. 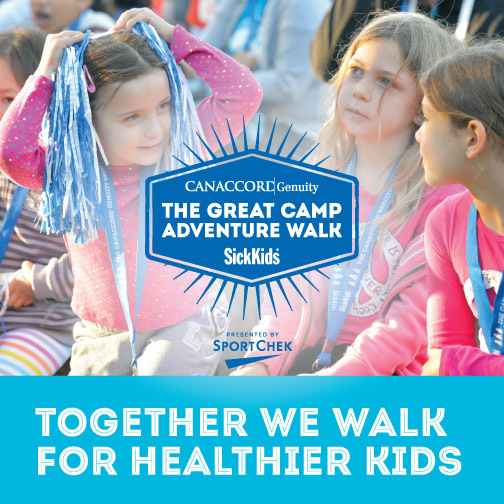 Formore information about the Canaccord Genuity Great Camp Adventure Walk, to register or to make a donation to someone participating, please visit: www.walkforsickkids.com. Established in 1972, SickKids Foundation raises funds on behalf of The Hospital for SickChildren (SickKids) and is the largest charitable funder of child health research, learning and care in Canada. Philanthropy is a critical source of funding for SickKids – one of the world's foremost paediatric health-care institutions. Thanks to the generosity of the community, and as a result of a record-breaking year in fundraising and investment returns, SickKids Foundation invested an unprecedented $129.3 million in grants and charitable activitiesfor the fiscal year ending March 31, 2014. For more information, please visit www.sickkidsfoundation.com. Throughits principal subsidiaries, Canaccord Genuity Group Inc. (the "Company") is aleading independent, full-service financial services firm, with operations intwo principal segments of the securities industry: wealth management andcapital markets. Since its establishment in 1950, the Company has been driven by an unwavering commitment to building lasting client relationships. We achieve this by generating value for our individual, institutional andcorporate clients through comprehensive investment solutions, brokerage services and investment banking services. Canaccord Genuity Group Inc. is publicly traded under the symbol CF on the TSX and the symbol CF. on the London Stock Exchange. The Company has offices in 10 countries worldwide, including Wealth Management offices located in Canada, Australia, the UK and Europe. Canaccord Genuity, the international capital markets division,operates in Canada, the US, the UK, France, Germany, Ireland, Hong Kong, China,Singapore, Australia and Barbados. To us there are no foreign markets.TM For more information, please visit www.canaccordgenuity.com. Part of the Canadian Tire Family of Companies, FGL Sports Ltd. is Canada's largest national retailer of sporting goods. Offering a comprehensive assortment of brand-name and private-brand products and operating more than 400 stores from coast-to-coast, FGL Sports includes the following corporate and franchise banners: Sport Chek, Sports Experts, Atmosphere, Pro Hockey Life, NationalSports, Intersport, Nevada Bob's Golf, Hockey Experts, the Tech Shop, and S3. FGL Sports also has websites for several of its corporate and franchise banners which can be accessed through its main website at www.FGLSports.com.